Maryland-based GriD Architects has taken cues from vernacular Appalachian houses and local rock formations to create this West Virginia home on a forested hillside. Having lost their original West Virginia home to a fire, a couple commissioned GriD architects to build a new residence on the rural site. The clients asked for a house that would be “modest yet inspiring; permitting nature to permeate the domestic realm”. A cuboid structure strides along a ridge on the narrow plot, exposing its interior to views of the surrounding forest. A second volume cuts through the plan, separating a painting studio to the east from a master suite and study at the opposite end. The architects intended the intersection to evoke a “modern reinterpretation of the vernacular dog-trot house found commonly in Appalachia”. A dog-trot house refers to a layout in which a breezeway crosses through and splits a rectangular plan into two sections. Beginning with an entrance porch, a combined kitchen, dining room and lounge slants through the width of the east-to-west layout. The volume opens onto a rear terrace, which features views of the Potomac River and a railroad down the hillside. Along with the crossing of the two plans, an overhanging roof makes the structure appear to fold – an aesthetic intended to evoke rock formations in the region. “The formal overlap subtly recalls the typical Edinburgh Limestone formations of the region – of which Seneca Rocks is an iconic example,” said GriD architects. The architects also referenced the form of local stone through the exterior cladding materials. “The material strategy uses standing seam metal roofing and locally sourced hemlock in opposed striations to subtly recall these rock outcroppings while reinforcing the overlap of the volumes,” said the firm. The concrete used for the porches on either side of the house continues inside. The broad, grey floors supplements the openness of the space – created by tall, white ceilings and abundant natural light. Runing the length of the eastern United States, the Appalachian Mountains provides sites for woodland homes from Alabama to New Hampshire. 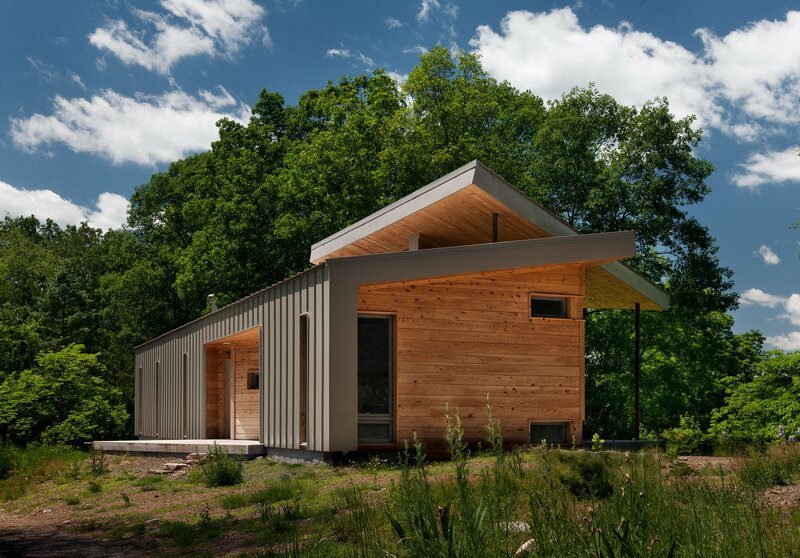 Other residences situated along the ridge include a black home on a forested hilltop in Virginia, and a North Carolina house made form cyprus-clad volumes protruding towards a valley. Baby Walker Helps me to know this info. Thanks, buddy! Photography is by Paul Burk. The post West Virginia home by GriD Architects perches above Potomac River appeared first on Dezeen.